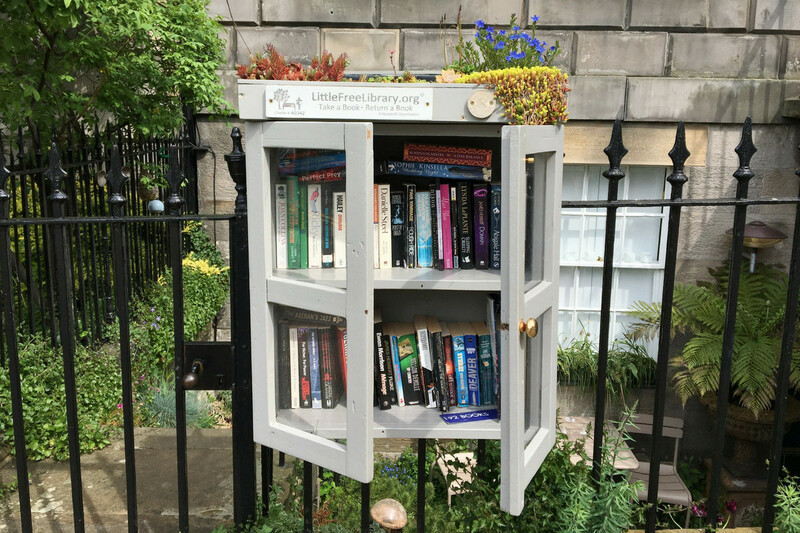 BlogPostsGreat Things to Do in EdinburghHave you heard of Edinburgh’s Smallest Libraries? Edinburgh has always had a strong link to literature and you’ll be happy to hear that independent bookshops and libraries are alive and well in the city. Recently, in an effort to inspire a new found love for reading in the city, Little Free Libraries have popped up around the city. The Little Free Library is a non-profit organization that inspires a love of reading, builds community, and sparks creativity by fostering neighborhood book exchanges around the world. The concept of a Little Free Library is quite simple: ‘ Take a Book. Leave a Book’. It’s an exciting project that we hope to see more of in the future. The fun part is each little library has its own personality from elegant to quirky! Here’s a guide to help you discover Edinburgh’s smallest libraries! Stockbridge has a real village feel to it and with great eateries and independent shops, we can’t think of a better place to stay: 88/(TFR) St Stephen Street. Where better to start than Edinburgh’s first 24 hour Little Free Library! Book Artist Rachel Hazell was inspired when she came across a converted phone box in Somerset and she knew it would be perfect for Edinburgh booklovers (read her full interview here)! The little library (which is made from gorgeous wood) is situated in Stockbridge’s extremely picturesque Colonies and is well worth a visit. Located near Haymarket, The Dalry Colonies are accessed from Dalry Place off the east end of Dalry Road and comprise eight charming streets. Unlike the others on the list, this colourful hand painted free library opens like a chest of drawers. We love the splash of yellow which adds a little colour to even the dreariest of days! Inverleith is a great place to stay when visiting Edinburgh and we think you’ll love 4/11 Hatters Lane. Tucked away between Royal Botanic Garden’s glasshouses and main Science buildings is a tiny wooden box crammed full of a great selection of fact and fiction, including plant and garden focused books. Also, if you’d like to donate books, you can donate to their Little Free Library at either one of their visitor receptions, at the East or West gates. Where better to have a little library than the location of Alexander Mccall Smith’s popular book series 44 Scotland Street! The elegant light grey box with a tiny garden on its roof fits in perfectly with New Town’s Georgian architecture. Another gorgeous holiday home is 40/(GFL) Cumberland Street. Perhaps the most creative little library on our list is located in Starbank Park! Much like Dr. Who’s Tardis, this Tardis shaped box holds a surprising amount! So, on the next sunny day, why not take a walk down to Newhaven and enjoy a book in the park! There is a wonderful charm about 88 St Stephen Street and with a brilliant collection of books it’s pretty close to a book lovers paradise! The two bedroom Stockbridge apartment feels homely and even has a cosy fire to curl up next to on cooler nights. Also, not only is it a short walk way from Princes Street, but it has wonderful independent shops right on it’s doorstep. We’d recommend popping into Lovecrumbs for a delicious slice of cake and be sure to pay a visit to the wonderful independent bookstore, Golden Hare Books. If you’d like to stay in one of our Edinburgh holiday homes for book lovers, check out our blog post!